Amsterdam is such a compact city that most of the sights are within easy walking distance of the city centre, giving a great opportunity to appreciate the resident Dutch architecture on foot. The Netherlands is the safest country in Europe for walking, but do beware of cyclists, who seem to have their own set of rules. 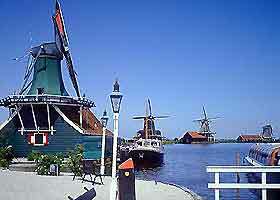 Amsterdam offers a multitude of appealing attractions and there is certainly something for everyone. Highlights include the Artis Zoo, the Concertgebouw, the Muziektheater, the Hortus Botanicus (Botanical Gardens), the Red Light district, and of course, cruises along the canals. This zoo dates from 1838 and is one of the city's top attractions, housing over 6,000 animals, most of which live in outdoor enclosures that provide surroundings representing their natural habitats as near as possible. The aquarium boasts one of the world's largest collections, and the nocturnal house offers a fascinating insight into the activities of these specialised animals during the hours of darkness. The zoological and geological museum, housed on this site, are also well worth a visit. Keizergracht (Emperor's Canal), Prinsengracht (Prince's Canal) and Herengracht (Gentlemen's Canal) are the three concentric ring canals which surround the old centre. Together with the Singel Canal they make a delightful walk but perhaps can be best appreciated from a canal cruise (which lasts between 60 and 90 minutes), where you can sit back in a glass-topped vessel, travel under picturesque bridges and marvel at the splendid architecture of the 17th- and 18th-century houses and warehouses with their magnificent cornices and gables. There are also many lovely individual shops to be found in this area, together with many inviting restaurants and bars. A cruise also gives visitors the chance to admire at close quarters the myriad of fascinating houseboats that line the canals, whilst enjoying wine and cheese, or perhaps indulging in a candlelit five-course dinner. 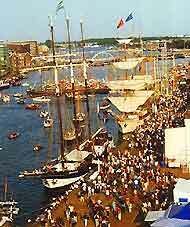 This is also the optimum way to see Amsterdam's large and busy harbour. There are also water taxis which operate along the canals calling at many of Amsterdam's top places of interest. This is the most famous concert hall in The Netherlands with acoustics considered to be among the best in the world. Primarily designed to hold concerts, the Concertgebouw now also plays host to conferences, corporate and political meetings, and even the occasional boxing match. The Muziektheater features opera and ballet and is widely acclaimed by top performers for its wonderful acoustics. This building is also known as the Stopera and incorporates the City Hall. Dating from 1682, this garden provides a green and peaceful oasis, housing 6,000 plant species from all around the world, with plants deriving from every climate and continent. In springtime thousands of tulips give a blaze of intense colour. Built in 1882 and based on the Spanish Riding School in Vienna, the Dutch Riding School was threatened with closure in the 1980s. Following a public outcry it was restored to its former glory under the direction of Prince Bernhardt and re-opened in 1986. The upstairs café is a great place to relax with a coffee or beer whilst enjoying the spectacle of the horses being put through their paces. A theatrical tour lasting approximate eighty minutes has actors recreating gruesome historical events. Attraction also includes the 'Reaper' roller coaster and a torture chamber display. Not for the faint hearted. Chance your luck at the Holland Casino Amsterdam, one of Europe's largest casinos, where a variety of gaming tables and slot machines offer numerous chances to hit lucky. There is a restaurant on site. Please note that the minimum age to gamble is 18. Amsterdam can justly be described as a jewel of a city and also a city of jewels. Here the diamond industry has flourished for 400 years and today there are many diamond-cutting centres in the city and numerous firms involved in the diamond industry. Amsterdam's diamond-cutters enjoy a deserved reputation for the excellence of their craftsmanship and quality. Many of the city's diamond polishers give free demonstrations of diamond cutting and offer sales of set and un-set stones. The prices may not be cheaper than elsewhere but a diamond factory will give you an extensive description of the diamond(s) that you purchase. Take a walk along the Singel and enjoy the many places of interest that line its banks. The narrowest house in Amsterdam is at No. 7, and is just one metre in width. There is also the Flower Market, which is partly housed on houseboats and offers an infinite variety of flowers and gardening paraphernalia. To the west of the ring canals is one of the oldest districts in the city - the charming Jordaan, which is a delightful area for walking and stopping off to enjoy the lively ambience exuded in its cafés, pubs and restaurants. This area also offers a rich diversity of quirky speciality shops and small craft studios. This part of the city, known as De Walletjes, is to the east of Dam Square, and is fringed by beautiful old houses and narrow streets. The Red Light District is famous throughout Europe for its scantily and provocatively dressed prostitutes displaying themselves in ground-floor windows under the glow of neon lights. 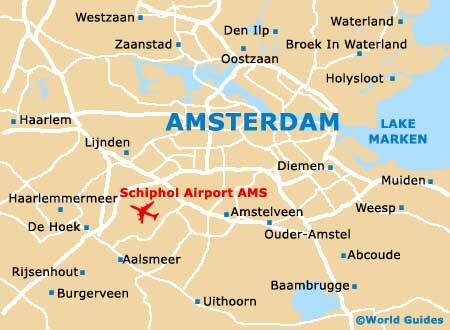 This area is also where the steamier clubs and Amsterdam's marijuana-selling coffee shops are located. Photographs are not allowed and beware of pickpockets and bag-snatchers. This tranquil haven provides a pleasant spot to take time out from the hustle and bustle of the city. The Begijnhof, dating from the early 14th century, is an enclosed courtyard situated behind the busy Spui shopping area, and comprises small historic houses grouped around a well-kept courtyard featuring lawns and tall trees. Dating from circa 1465, one of the houses here is the oldest maintained wooden house in the country. Formerly a convent inhabited by the Beguines, who were unmarried or widowed women from wealthy families who lived a religious life without taking monastic vows, whilst devoting their lives to caring for the elderly. The last true Beguines died in the 1970s. There are many important buildings overlooking this vast and bustling open space, including The Royal Palace, the Nieuwe Kerk and the War Memorial. This is the real heart of Amsterdam, and Amsterdam's name originated from here - 'Dam on the Amstel' with the original dam being built circa 1270. Primary uses of the square include ceremonies for the royal family, political demonstrations, street performers, remembrance day celebrations and social gatherings. Leidseplein is located at the end of Leidsestraat on the edge of the inner city. A popular place for visitors with every conceivable form of entertainment available including a wealth of restaurants, cabaret, clubs, pubs and bars. Named after the great artist whose statue adorns the central green area, the Rembrandtsplein ranks with the Leidseplein as being the most important entertainment area of Amsterdam. The area is home to numerous striptease establishments, nightclubs and cafés and restaurants.